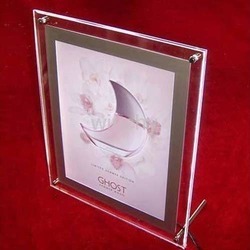 We are the leading manufacturer, supplier and trader of LED Photo Frame. This product is manufactured by team of skilled professionals using supreme grade raw material in adherence with set industry norms. We are reckoned as major entity actively engaged in offering high-quality Slim LED Photo Frames. We bring forth the ultra light and energy saving photo frames that work best for indoor decorations and also utilized widely for advertising and promotional purpose at chain stores and food joints. The bright and power saving frames are incorporated with LED panels and designed with an easy closure which is hassle free and time saving. Our company is widely appreciated in offering LED Photo Frame to the clients. This product is available in various sizes and specifications. The production material has been procured from most trusted and reputed companies that are always preferred to supply flawless and standard products. It is appreciated for its excellent grade LED or light emitting diode crucial to its excellent performance. Looking for LED Photo Frame ?